Parents’ Dilemma: Wooden Teething Toys for Babies or Plastic? The child-toy relationship goes a long way, considering there is the right toy for every step of childhood. Regardless of whether you are one of those parents who can’t refrain from buying toys, or are a parent who doesn’t buy as many toys following the “less is more” minimalist motto, the truth is children need toys ever since they are babies. Take the example with the teething toys for instance, the necessity for relieving the pain of delicate teething gums, as well as help with the cognitive development (i.e. the fine motor skills), by stimulating the senses, and concentration, meaning they are helpful with the physical and intellectual development in the early stages of life. So the question should be whether to buy wooden teething toys for babies or plastic and not whether to buy or not in the first place. Here are some words on both options to make your choice easier. While wood may seem like the option to avoid, because of its roughness, there’s more to wooden teethers than it seems. As can be guessed, they are as durable as can be, which is why they are among the toys most probable to be passed down from generation to generation, and they are versatile, in types with or without rattles, but what can most make parents convinced on buying them, with peace of mind, is the fact how eco-friendly they are. 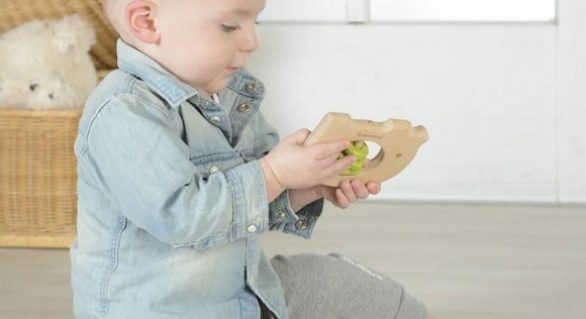 Handcrafted from certified woods, like European beech, without the use of toxic paint, glue, and any chemicals, meaning they are lead free, and BPA free, wooden teething toys for babies are safe to chew on which isn’t to say about plastic teethers. Moreover, wood is naturally antibacterial, and there are wooden teethers with natural numbing oils that can further be of help with teething pain. The problem with plastic teethers is you can’t be sure they are BPA free, some are, some aren’t, and while they are easy to play with, they aren’t that durable and can break. Once that happens, the tiny pieces can be swallowed by your baby accidentally, so they can pose choking risks. On the plus side, they are everywhere, they are affordable, easy to wash and disinfect, as well as chew on, and the many shapes and colours they can be found in are sure to be fun for babies to look at, and grab. When buying these toys it’s especially important to look at the labels, see what they are made of, and check if they are suitable for the age whereas with wooden toys you have no worries on toxins, so take the pros and cons of these two options, and make your pick.